In the end, 2015 Malaysia Cup Champions Selangor did what was expected and brushed aside a determined third tier side AirAsia Allstars FC with two unanswered goals. But for the best part of 70 minutes the semi-professional side frustrated their more illustrious opponents and must be given credit for their night’s efforts. Selangor head coach Zainal Abidin Hassan was widely expected to field a weakened side to rest some of their regular starters. That he started with essentially the best eleven players available to him, aside from perhaps goalkeeper Khairul Azhan who came in for first choice shot-stopper Norazlan Razali, gave an indication of the pressure Zainal is under and thus his unwillingness to take any risks. The only tactical shuffle from the side that triumphed in Ipoh on Tuesday was Raimi Md Nor being pushed up to the left wing and Azmi Muslim coming in at left back. Hadi Yahya started behind Patrick Wleh supported by Indonesian Andik Vermansah on the right while the midfield partnership of Hafiz Kamal and Saiful Ridzuan Selamat were retained from the Perak game. Captain Shahrom Kalam, Razman Roslan and Azrif Nasrulhaq completed the rear-guard. The first half set the tone for most of the match with AirAsia getting men behind the ball and hoping to catch Selangor with quick counter attacks. The Red Giants relied heavily on moves down the flanks in their attempts to penetrate a stubborn AirAsia defence especially via Andik on the right wing. However, for large periods in the game, the final ball to Wleh and Hadi left a lot to be desired. Wleh, faced with an entirely local defensive line, failed to impose his considerable physical advantage for most the night. Despite this, the Liberian International managed to barge his way through the AirAsia backline just past the half-hour mark to slot the ball into the net but the goal was inexplicably flagged off by the linesman. A couple of other openings were wasted by Wleh and Hafiz before the night’s referee blew for halftime. Selangor keeper Khairul Azhan was a mere spectator. If the first half was somewhat one-sided, the second period was a decidedly one-way traffic where AirAsia forays into the Selangor half were few and far between. Hadi saw his rasping shot from the edge of the penalty box clatter against the crossbar on the hour before Andik missed a gilt-edged chance by snatching his left foot shot wide from no more than 7 yards just a minute later. Shortly after, Wleh, toiling away fruitlessly thus far, wasted yet another opening inside the penalty box. The Red Giants faithful must have been wondering if it’s their night. If at first you don’t succeed, then try and try again as they say. In the 69th minute, a purposeful run was made down the by-line by Andik Vermansah who then delivered a perfect cross from which the visibly tiring Wleh easily nodded home. In all intents and purposes, the match as a contest was over as AirAsia rarely looked like they had enough in them to come back in the game. A defensive howler at the centre of the AirAsia defence was gleefully latched on by Hadi Yahya to add some gloss onto the scoreline in the 77th minute. One worrying sight for Zainal and Selangor fans was Partick Wleh limping off with 15 minutes to go. Early indications are that it is just down to fatigue. With 6 players already out injured before the match, Selangor really cannot afford another one especially in attack. As far as this tie is concerned, it’s job done for Zainal and his men. 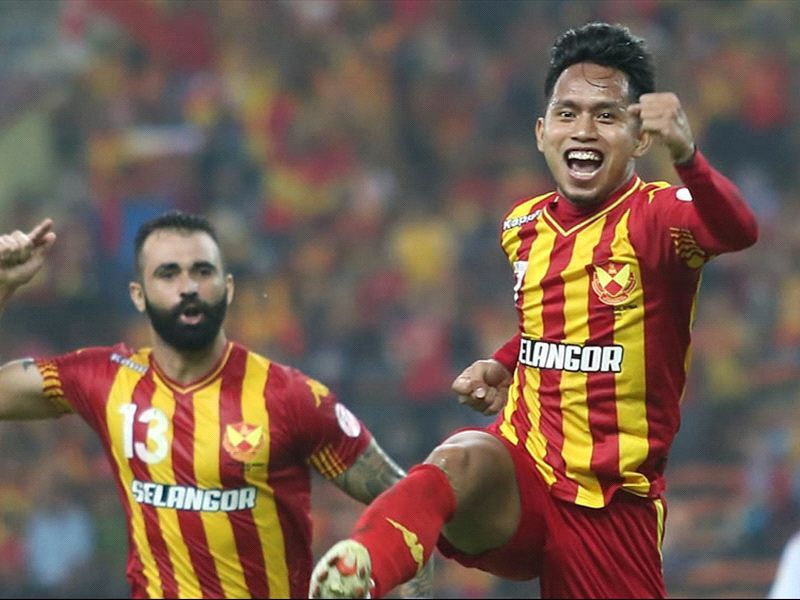 Selangor line-up: Khairul Azhan, Shahrom Kalam, Razman Roslan, Azmi Muslim, Azrif Nasrulhaq, Saiful Ridzuan Selamat, Hafiz Kamal (S. Veenod 79m), Andik Vermansah, Raimi Md Nor (Bunyamin Umar 85m), Hadi Yahya, Patrick Wleh (Adam Nor Azlin 75m).